← Thunder? Pfft! That Doesn’t Scare Me! This morning on Facebook, I saw this and it resonated with me. 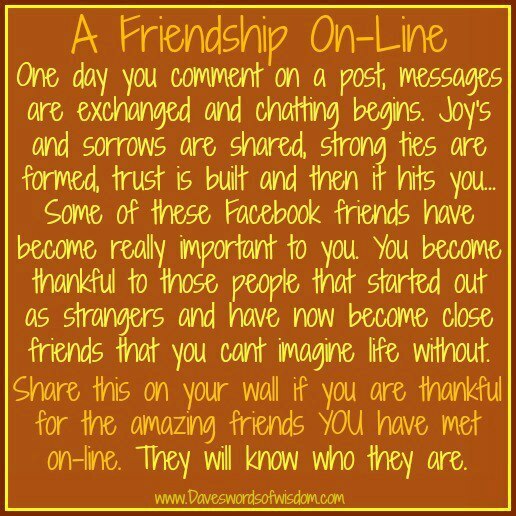 I would add to it, the friends I’ve made in the Blogosphere as well! Connecting (or re-connecting) with long-lost friends, introducing our families to each other and all, not only get along, but have a fabulous time! Teaching our children to break the law… um… by joining them in jumping off a bridge into the river! Getting the whole family (almost) – aunts, cousins, brothers, sisters, husbands, wives – together for a summer BBQ and the weather is fantastic. Hugs and kisses from those we only see once per year or less; knowing the feeling is mutual in missing each other. Driving home after midnight, with nary another driver in sight, listening to good tunes and knowing your passengers feel safe in your hands. This entry was posted in Family, Friends, fun stuff, Gratitude, Well-being and tagged al-fresco dining, campfires, family get-togethers, good food, gratitude. Bookmark the permalink. It truly resonated with me as I feel I’ve found some good new friends via Facebook! I had a great weekend with friends too, it is always fun to catch up. Absolutely! He, poor guy, got shaved and is looking rather, um, well… not at his best! I shall include a photo in my next post! Those clean up fairies keep skipping my house too;0) Sounds like you had a great week! Love the sense of family you portray and, of course, the bit about the bridge! !